Accenture forecasts that the retail industry could grow operating profits to $2.95 trillion by 2025. 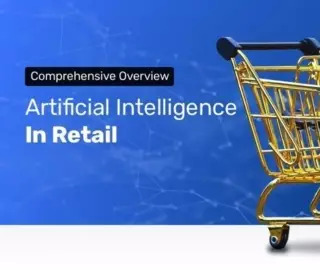 We’ve covered AI in retail extensively on Emerj, and in this report, we dive into the Asian startups that are offering AI solutions to retailers. Asian AI vendors seem to offer retailers solutions for marketing, sales, operations, and making purchases easier, among other areas. ViSenze is a Singapore-based company that offers a namesake software that the company claims is capable of allowing customers to search by image. Once the software is integrated into a retailer’s website, customers could upload a photo to the website’s search bar. The search software would then return a visually-similar item for the customer. Additionally, ViSenze claims that shoppers can use the Search by Image application by taking a photo of an item in a store and uploading it onto the same brand’s eCommerce site. ViSenze claims to have helped Uniqlo provide a visual search tool to its online shoppers. Uniqlo realized that the limitations of text-based search were resulting in customers not finding the exact products they wanted to buy in Uniqlo’s catalog. This in turn resulted in lost revenue. The company needed an application that would help online shoppers search for exact or similar items on their eCommerce site. The company implemented ViSenze’s software. Uniqplo claims that this eliminated keyword guessing during the product search process and yielded higher conversion rates. That said, the case study did not provide statistics to back up this claim. ViSenze also lists Zalora, Mataharimall.com, La Redoute, BlueStone, Comb, and GoodRich as some of its past clients. Chua Tat Seng is Chief Science Officer at ViSenze. He holds a PhD in Computer Science from the University of Leeds, UK. Chua also serves as Chair Professor at the National University of Singapore (NUS) School of Computing. He has worked in different roles at the NUS since 1990. Trax is a Singapore-based company that offers a software called Trax Technology Stack, which it claims can give consumer packaged goods businesses a view of how their products compete with other brands on the retail shelf using computer vision. The company claims that this can help businesses develop strategies for where to display their products on shelves and inventory management. To use the application, Trax claims that companies can send employees to take photos of store shelves that stock their products. Installing the app on a camera-equipped device, such as a smartphone, gives the company’s software access to the camera. The pictures captured by the camera are sent to the Trax database in the cloud, where the computer vision detects objects on the shelves and categorizes them. Meanwhile, the software compares the photos with images in its database. The software can then purportedly detect anomalies in the shelf lineup, such as new products on the shelf, competitors’ new packaging designs, or different product placements, among others. It can also detect when shelf space is empty. Over time, Trax claims that the aggregated data will enable brands to build a database that can be used in analytics that correlates sales with the products’ position on the shelves. Trax claims to have helped Coca-Cola Hellenic Bottling Company reduce audit times at stores, reduce out of stocks, and increase store coverage. As a result, the company was purportedly able to increase sales. Coca-Cola Hellenic’s existing sales program faced several challenges. Hiring an external sales agency to perform manual store audits and collection was costly. As a result, Coca-Cola could only afford for the agency to cover 28,000 stores in 35 cities monthly. Since using Trax’s computer vision system, Coca-Cola Hellenic’s sales reps reduced audit times from 20 minutes to 2 minutes in traditional channels and from 45 to 15 minutes in new channels. This enabled them to increase sales coverage to more than 130 cities and 130,000 stores monthly. Because the sales reps were able to visit more stores more often, out of stocks were also reduced by 63%. The study claims that since implementing Trax’s software, Coca-Cola Hellenic increased its execution scores by more than 10%. Their internal studies had shown that for every percent increase achieved in their execution scorhe, sales also sowed a 1% increase. Trax Retail also lists Coca-Cola Amatil, Henkel, and Coca-Cola Japan as some of its past clients. The company has raised $286 million in funding from Boyu Capital, Warburg Pincus, Investec, and Broad Peak Investment. Yair Adato is CTO at Trax Retail. He holds a PhD in computer science from Ben Gurion University of the Negev. Previously, Adato served as Chief Scientist at Vicomi and software engineer and integrator at BVR systems. He also had a stint at Google as an intern engineer. Zenatrix is an Indian company that offers software called Wattman and Wattman Lite, which the company claims can help retail chain businesses reduce their establishment’s energy consumption and conducts predictive and preventive maintenance on air conditioning systems using machine learning. Zenatrix reports that the application works by collecting data using its connected temperature and humidity sensors, energy meters, weather-reading software, and other devices. The application sends the data to the cloud-based server where the machine learning calculates the correct temperature or predicts if preventive maintenance measures are needed. The company did not specify how this is done, but we can infer that the algorithms might search the database for information about appropriate cooling temperatures when the weather, temperature, humidity, and foot traffic are at a certain level or the time of day. Once the algorithms find the appropriate temperatures, it will make recommendations to the system, which will then automatically adjust the AC temperature. The algorithms might also search its database for the standard conditions of healthy electrical assets and compare these with the actual assets that the business currently uses. Any deviation from the standard might signal to check if the assets need repairs or replacements. Zenatrix claims to have helped an unnamed supermarket chain reduce its electricity bills across its 300 stores in India. The supermarket chain was faced with a number of challenges related to its energy consumption and air conditioning (ACs) unit operations. Electricity bills ran up to $2.5 million monthly at all its outlets. The AC units at its stores operated the whole day, even outside business hours, and were occasionally broken, leading to unpleasant customer experiences. Staff manually noted the temperature inside refrigeration units every few hours and reported to management at the end of the month. At its restaurants, the chain had no way to track the condition of electrical assets and did not know when cold rooms or ACs needed maintenance checks. With the deployment of Wattman, its sensors recorded data, such as footfall, ambient temperature, and indoor temperature. It then adjusted the AC temperature when needed. As a result, the chain reports that its energy consumption was reduced by 15% across the stores. Wattman also provided the chain’s operations team with centralized visibility over electrical assets and timely updates which improved reporting by 60%. The study claims that the updates enabled the team to schedule maintenance checks or repairs on ACs and refrigerators and helped the restaurants maintain food quality and customer comfort. The client, however, was unnamed, and so readers should be wary of this case study. Zenatrix also lists Mother Dairy, Domino’s Pizza, FabIndia, Future Retail, Vodafone, State Bank of India as some of their past clients. The company was acquired by India-based Hero Electronix. Amarjeet Singh is the CTO at Zenatrix. He holds a PhD in Electrical Engineering from the University of California, Los Angeles. Previously, Singh served as Assistant Professor at Indraprastha Institute of Information Technology, Delhi and Senior R&D Engineer at Tejas Networks. Megvii Technologies is a Chinese company that offers an open facial recognition software called Face++ . Although not specific to the retail industry, the CEO of the company claims that Face++ could have retail applications. For example, Ant Financial is currently using Face++ behind their Alipay software, which the company claims allows customers at a particular KFC-offshoot store, known as KPro, to pay for their meals by smiling. In order to offer such an application, customers likely need to upload many images of their faces at various angles and in various lighting to a retailer’s website, or in this case Alipay. Customers would also need to enter their credit card information. In theory, this would allow the customer to walk into KPro and smile at a camera when they select the meal they wish to order. The software would then charge the customer’s credit card. Megvii also mentions that retailers can use Face++ to offer customers the ability to buy products on eCommerce sites using their face. The company claims it provided Oppo with its facial recognition technology that enables Oppo smartphone users to unlock their phones and make payments. It is unclear what kinds of payments the company claims users can make, however. Megvii also lists Vivo, Uber, Alibaba, CITIC, and Xiaomi as some of its clients. It has raised $607 million in funding from the Boyu Capital, Alibaba Group, and SK Group, among others. Qi Yin is the CEO at Megvii. He is working towards a PhD in Computer Science from Columbia University and holds a Master’s degree in Computer Science from the same university. Previously, Qi served as a researcher at Chinese University of Hong Kong and Microsoft Research Asia. Zenatrix was acquired by Hero Electronix in May 2018, which may speak to the legitimacy of its software. Zantrix’s clients are more local than the other companies listed in this report, which boast international clients. Visenze’s solution is one that several retailers seem to be offering, which may bode well for it for having tapped into an apparant demand. Megvii’s facial recognition application has broad use cases, according to the company, although it should be noted that checkoutless shopping capabilities are extremely nascent. According to the company, the technology can be used in gaming, security, retail, and industrial automation. Additionally, the company has raised the most funding from major investors among the companies covered in this report. In addition, the company makes available several case studies and lists a variety of marquee clients. It is much more difficult to use AI when dealing with the physical world. Trax may offer a solution for CPG companies looking to gain competitive intelligence and determine ways to acquire greater shelf space at the stores at which their products are featured, but their solution is not autonomous. The company states that its clients’ employees need to physically show up at stores and take pictures of the products on its shelves. In the future, retailers might be able to line their store shelves with cameras and sensors that feed machine learning systems with visual information, but such a capability is again extremely nascent. At present, CPG companies looking to integrate AI into their shelf space management workflow should be prepared to allocate staff to enter physical stores the same as they had before.